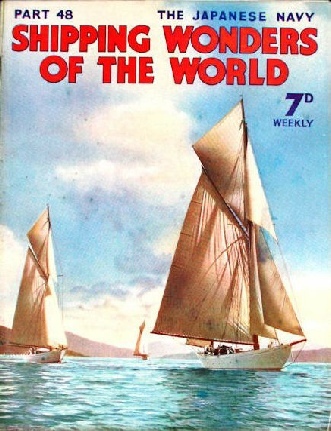 Part 48 of Shipping Wonders of the World was published on Tuesday 5th January 1937. It included a centre photogravure supplement illustrating the aspects of the work of the marine engineer. It formed part of the article on The Marine Engineer. This week’s cover is a hand-tinted picture taken from a Kodak snapshot. It shows the yachts Vadura, Finmara, and Fiona on the Clyde near Rothesay. Famous though the vessels were, surprisingly little comfort could be obtained on a voyage to India or China in an East Indiaman, despite the exceptionally high prices paid for a passage. The East India Company, founded in 1600, was responsible for the development of India until the Government took control in 1858. The Company was fabulously wealthy and one of the most famous organizations of its kind that have ever existed. Robert Clive and Warren Hastings were two famous servants of the Company. Despite the wealth of the East India Company, and the luxuries to which some of the passengers in its ships were accustomed when on shore, travel in the East Indiamen, as the ships were called, meant the acme of discomfort. The Indiamen were notoriously slow sailers, and the long voyage round the Cape of Good Hope was monotonous and uncomfortable as well as exceedingly expensive. However unpleasant it may have been to travel in the East Indiamen, they had and still have a special fascination for the student of shipping history, for they were unique. Here Walter Wood contributes an account of life in the East Indiamen, and includes information from a rare book which was published in 1762 and tells of a typical voyage in one of these ships. The ship was at sea for thirteen months and two weeks, and in that time she sailed from London to China via St Helena and Batavia and back again. You can read more about East Indiamen in E Keble Chatterton’s book The Old East Indiamen (1914). The story of the fate of von Spee’s German squadron off the Falkland Islands, concluded from part 47. This chapter is by Lieut.-Commander E Keble Chatterton and is the seventh article in the series on Decisive Naval Actions. A FIREMAN IN A CARGO SHIP. 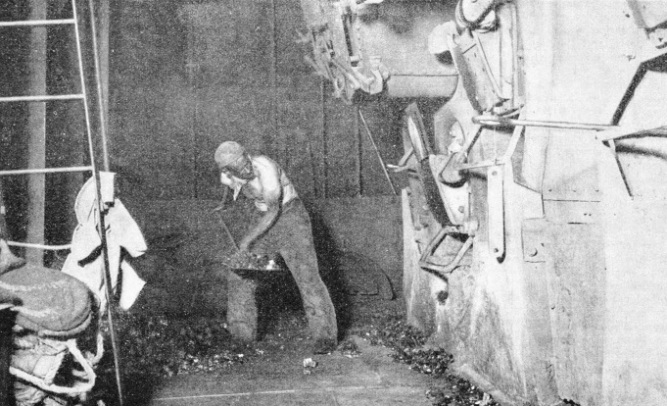 The old type of coal firing is passing in the big liners with the adoption of oil fuel or mechanical coal-stoking, but it survives in many cargo steamers. The work requires considerable skill and is particularly arduous in hot climates. The fireman has to know the exact spot in the furnace where the shovelful of coal should be thrown and the exact amount required. He must keep the boiler furnace fires properly levelled and the fire bars clear of clinkers and other useless products of combustion. IN A GREAT LINER the orderly maze of machinery is often awe-inspiring. 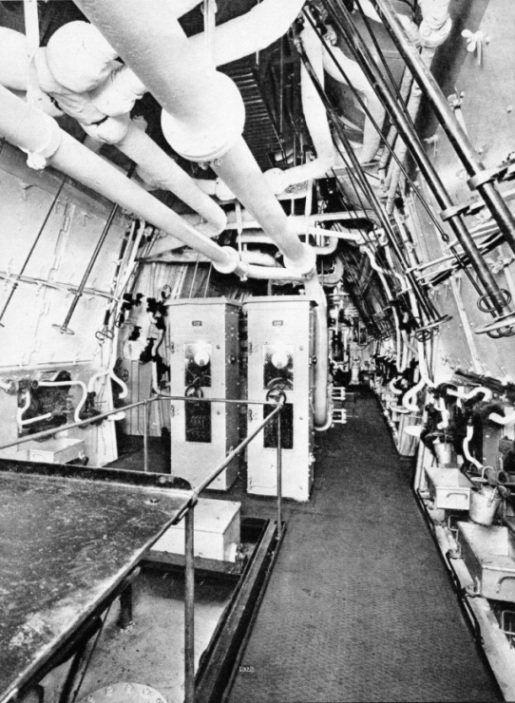 This photograph shows the central platform in the forward engine-room of the Canadian Pacific liner Empress of Britain (42,348 tons gross). The engineer who aspires to control marine machinery has to pass at least two Board of Trade examinations. The first is that for the second-class certificate of competency, for which he cannot sit until he has been eighteen months in charge at sea under a senior engineer. The second examination is for his chief engineer’s ticket. The applicant must have been in charge of a watch with a second-class ticket for at least a year. The most ambitious marine engineers will sit also for their extra chief engineer’s certificate, which proclaims the holder to be a first-class man. BUILT IN 1790 at Deptford, on the River Thames, the True Briton was one of the famous vessels of the East India Company. She was of 1,209 tons by her builder’s measurement. Losses to the East Indiamen were appallingly heavy and the True Briton did not have along life. 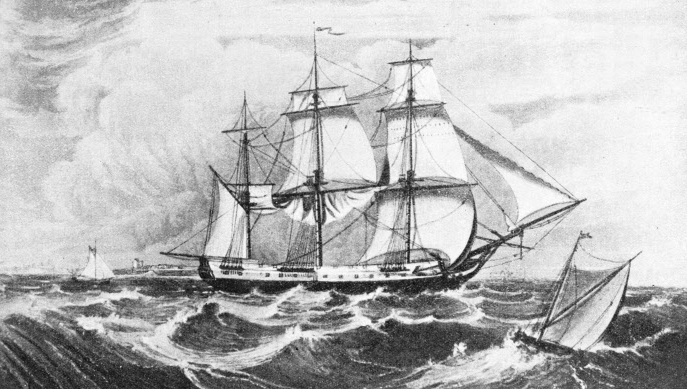 On a voyage to Bombay and China in 1809 she disappeared at sea without a trace. An apprenticeship of five years is necessary before a boy is eligible to become a ship’s engineer. Once he has passed his examinations and gained his certificates he has before him many opportunities of self-advancement. For the ambitious youngster who is interested in machinery and hankers after a sea-going career, marine engineering offers many attractions. This chapter by Frank Bowen is a comprehensive review of the best means of obtaining training and the sort of posts that are open in this branch of seafaring. The article is the fifth in the series Going to Sea. The victim of uncontrolled speculation before the coming of railways, the British canal system was never used to the best advantage. Co-operation and enterprise, however, are doing much to revive the latent commercial value of canal transport. R L Stevenson describes life on a canal barge as the most delightful existence, “for it is both to travel and to stay at home”. A P Herbert has also been impressed with the fascination of canal life. Towards the end of the eighteenth century there was a craze for canal-building and an enormous number of canals were built in Great Britain. 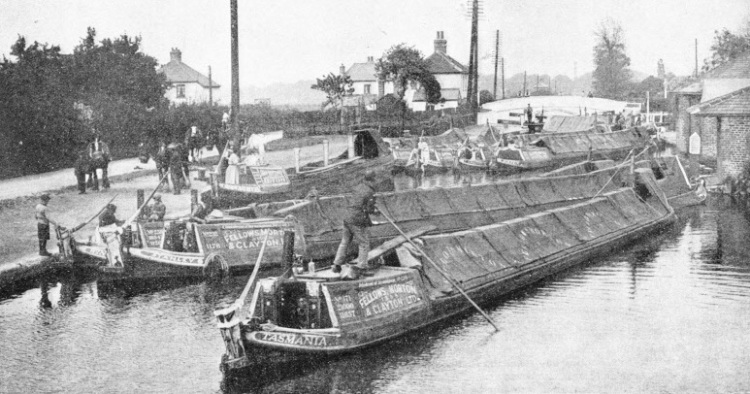 In this chapter, written by Frank Bowen, the smaller canals which are important to British transport and also as links to the sea, are described. 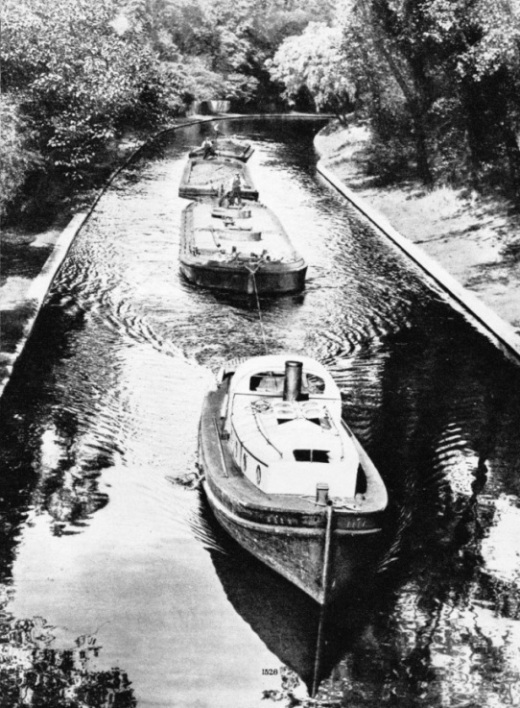 TEMPORARY CONGESTION ON THE GRAND UNION CANAL was caused by the cleaning and renovation of Hanwell Lock, Middlesex. Such work is done speedily but holds up traffic for a short time. The Grand Union Canal Company was formed in 1929 and took control of the Regent’s Canal, the Grand Junction, Warwick and Birmingham and other canals. The main line of canal under the new control is 147 miles, and numerous branches bring up the total length to 240 miles. In little more than fifty years Japan has grown from small beginnings into a naval Power of major importance with a fleet which, in efficiency, as well as in numbers, rivals the navies of any part of the world. The first steamship to be built in Japan was an armed wooden cruiser laid down in Nagasaki in 1860. In the next few years Japan bought a number of warships from America and Europe. Others were built for her by British firms. Towards the end of the nineteenth century, however, her navy included many ships of Japanese construction. A similar policy was followed with the personnel of the Japanese Navy, and the British Admiralty was persuaded to send British naval men to serve in an advisory capacity and as instructors at the Japanese cadet college in Tokyo. By this speedy assimilation of all that was best in the naval practice of other countries, Japan developed in fifty years a navy that was as efficient as those which other countries had built up in a hundred years. This chapter, by Hector Bywater, will describe the units comprising this navy and gives a brief review of the strategic situation in the Pacific to-day. The article is the third in the series on the Fleets of Foreign Powers. WATER TUBE BOILERS in the Monarch of Bermuda (22,424 tons gross). 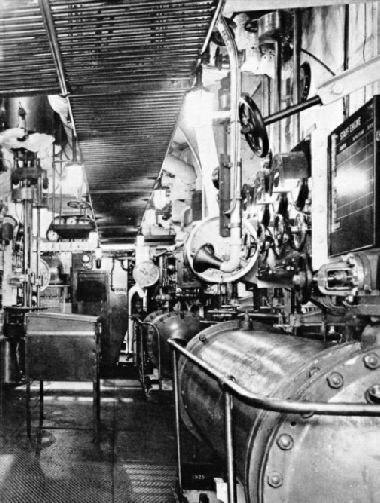 There are eight of these boilers, arranged in groups of four, and they supply power to turbo-generators for the electric propulsion of the ship. The electricians on board a ship are not certificated men, but they must have served their apprenticeship and have obtained practical experience on land. Each is under the engineer in charge of the watch and has to undertake all kinds of detail work connected with the electrical side. Electricians must be fully qualified, but they can never rise above the rank of senior electrician. 14 ft 9 in. The Kako, which resembles the Kinugasa, has many original and unusual features in her design. Her 8 in guns are mounted in single turrets and her bridge works and masts are arranged in unique fashion. 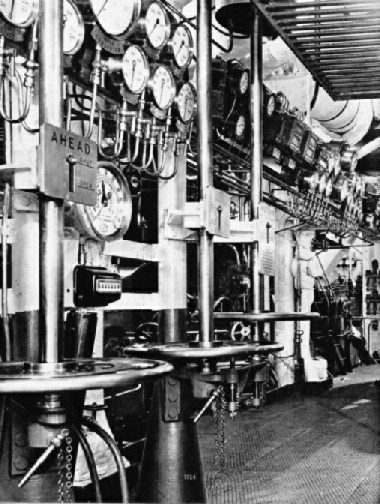 tube boilers arranged immediately forward of the engine-room. They exhaust into the single raked funnel. 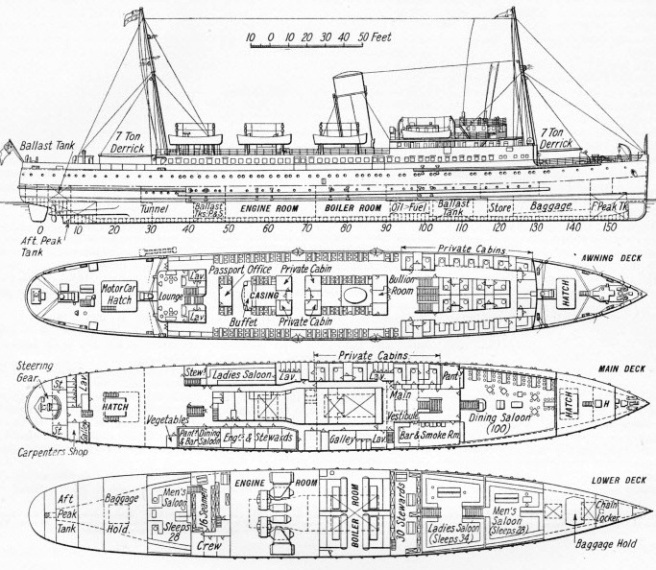 This is the thirty-eighth article in the series on Merchant Ship Types. The risk of serious danger from accidents at sea has been considerably reduced by the introduction of strict regulation governing the loading of ships and by the perfection of such equipment as lifeboats, wireless and the like in every type of merchant vessel. In bygone days the provisions for safety at sea were few, and badly enforced. Happily the world is more enlightened nowadays, and conscientious shipowners will take every care to see that their vessels are perfectly seaworthy. Owners who might be tempted to overlook precautions are hedged about with Board of Trade and other restrictions so that it is virtually impossible for an unsafe ship to pass the inspectors. Lifebelts, boats, wireless, loadline regulations, watertight bulkheads and so forth all minimize the risk of a disaster at sea, and there is no reason for anybody to be fearful of a sea voyage. This chapter is by Frank Bowen and the article is concluded in part 49. IN THE HEART OF LONDON the Regent’s Canal passes through quiet scenes on its course between the warehouses and traffic of Paddington and the wharves and docks of the Port of London, a distance of 8½ miles. Completed in 1820, the Regent’s Canal linked the London Docks with the Grand Junction Canal, thus affording another direct outlets by water for the goods of Birmingham and the industrial Midlands. STEEL HATCH COVERS have an advantage over wooden covers in that they make the hatch almost as strong as the deck itself. The hatches and tonnage openings are always regarded as a weak spot, as they are often pounded by heavy seas. 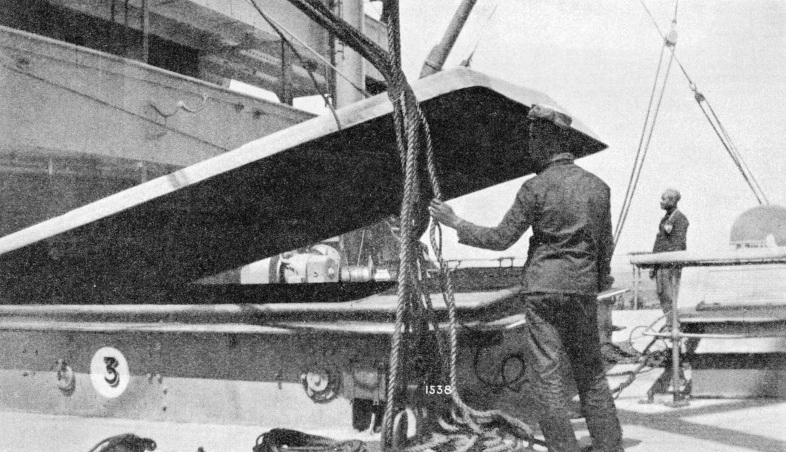 Steel covers of the type illustrated are the invention of Captain Sweeny, Marine Superintendent of the Peninsular and Oriental Line.